MARANA, Ariz. -- I had the opportunity to spend some time with Martin Kaymer last week and among the many things I asked him was this simple query: "Who is the best golfer in the world?" His answer was both predictable and politically correct. "I think the No. 1 in the world, Lee Westwood," he replied. "The way he's played golf over the past two years. He was so close to winning majors; the way he played TPC Sawgrass last year, he was so close. So because he's played so consistently, he's No. 1." Considering his deference to the Official World Golf Ranking formula, I was even more interested to ask Kaymer the same question Saturday, after he reached the final of the WGC-Accenture Match Play Championship. That's because no matter how he fares in Sunday's championship match against Luke Donald, when the newest ranking is formulated Monday morning, it will show Kaymer as the 14th top-ranked golfer since its inception in 1986. So, Martin, tell us now: "Who is the best golfer in the world?" "Still Lee Westwood," he said, then paused and added, "until Monday." For such a stoic guy on the course, Kaymer can actually be quite an engaging personality. That response drew some laughs from the assembled media, but when pressed for an answer about the world's best golfer starting Monday, he was finally forced to put an end to the humility. "Well, when the rankings say that I'm the No. 1, then I'm the best player in the world," he explained. "And if they say so, then that's the truth." They will say so whether Kaymer defeats Donald in Sunday's 18-hole final or not, but the ascendancy will feel hollow and anticlimactic should the impending top-ranked player fail to clinch his sixth worldwide title since the beginning of last year. It's a notion he is struggling with already. "I'm in the middle of the tournament," he said. "It would be fantastic [Sunday] if I could win, then it really feels like I deserve to be the No. 1. I'm not saying that I don't deserve it, but it would make me feel better if I would win instead of finishing second [Sunday]. So, yes, it is a little strange." Much like many observers don't often believe the Bowl Championship Series is the greatest way of determining the best college football team, there are those who believe golf's world ranking is similarly flawed. The system arranges players using a mathematical algorithm over a two-year rolling period, failing to take opinion into account. Kaymer, though, is among those who still believes the computers get it right. And so sometime next week, after he's had a day or two to digest it, he'll finally come to the realization that he is now the best player in the world. "Maybe on Tuesday or Wednesday, when I see my name up there," he said. "I'll definitely take a picture of that moment." Jason Sobel is a golf writer for ESPN.com. He can be reached at Jason.Sobel@espn.com. Editor's note: See Sobel's NCAA tournament-style bracket predictions here. Trying to predict golf tournaments is an exercise in futility, but trying to predict the WGC-Accenture Match Play Championship might be the literal definition of "inexact science." And yet, that doesn't mean we can't employ some prior knowledge in an attempt to prognosticate what might take place this week outside Tucson, Ariz.
Let's break down the four brackets to help with those annual office pools -- for, uh, entertainment purposes only, of course. Strength: Youthful exuberance. The only bracket with two teenagers (Ryo Ishikawa and Matteo Manassero) also features a half-dozen players in their twenties. Weakness: Recent wins. Plenty of proven champions in this mix, but only one player owns a victory so far this season -- Charl Schwartzel at the Joburg Open. Best opening-round match: There isn't a non-winner playing better on the PGA Tour than Nick Watney, who owns three top-six finishes in three starts this year, but Anthony Kim is a fiery competitor who thrives in this format. Best potential later-round match: It would take the desert stars aligning precisely right, but if the Molinari Bros. each pull off three victories, they would face each other on Saturday morning. Upset special: Steve Stricker is a wily veteran and one of the world's best putters. His opening-round opponent, Manassero, has nothing to lose, though -- and plenty to gain. Sleeper: Martin Laird has proven his Scottish roots translate to great desert golf, as he's posted a win and a playoff runner-up in his past two starts at the PGA Tour's stop in Las Vegas. Winner: Only Matt Kuchar posted more top-10 results on the PGA Tour last year than Retief Goosen, whose overall consistency failed to capture a victory. That said, consistency is rewarded in match play and the now grizzled -- and sometimes grizzly, depending on his facial hair decision -- veteran has plenty of experience in this format. Strength: Ball-striking. There isn't a better collection of pure swings in any other bracket, as these guys should hit many of the course's large greens in regulation very frequently. Weakness: Jetlag. Five of these 16 players are not regular members of the PGA Tour, which ties for the most in any bracket and means there could be plenty of redeyes going out on Wednesday -- and maybe coming home, too. Best opening-round match: Hunter Mahan and Sean O'Hair are close friends, employ the same swing coach (Sean Foley) and often play practice rounds together. It will be interesting to see if they can get into a more competitive mode against each other for this one. Best potential later-round match: Adam Scott was Rory McIlroy about a decade earlier. A can't-miss superstar with a billion-dollar swing, he's been very good at times and very average at others. Perhaps young McIlroy will seek tips on how to better remain on the championship path. Upset special: In 10 career starts at this event, Jim Furyk has never advanced beyond the third round. He'll face a guy in Ryan Palmer who is already playing some strong early-season golf. Sleeper: Yuta Ikeda has now played in 13 career PGA Tour-sanctioned events and never finished better than T-22. It's only a matter of time before the 25-year-old makes a splash, though. He owns eight career international victories. Winner: Tough road game for European Tour member Martin Kaymer, huh? Not exactly. The world's No. 2-ranked player actually lives just 75 minutes away in Scottsdale and while he won't commute during the week, he's not quite a foreigner when it comes to playing desert golf. Strength: Overall talent. Top to bottom, no bracket has more raw talent than this one. Though Tiger Woods obviously skews the numbers as far as major victories, three others own such hardware and another three have already won titles this season. Weakness: Injuries. Tim Clark has a bad toe, Camilo Villegas has a bad back and Ernie Els has a bad neck -- all of which has caused them to withdraw from tournaments in recent weeks. Best opening-round match: There might not be a better first-day pairing on the entire sheet than Geoff Ogilvy versus Padraig Harrington. Someone should mike these guys up, too; as two of the game's more thoughtful and eloquent speakers, their conversations could be riveting. Best potential later-round match: Chicks dig the long ball. So, too, does everyone else, which means a possible second-round matchup between Bubba Watson and Dustin Johnson would be a fun "anywhere you can hit, I can hit farther" experience for all. Upset special: Peter O'Malley. Nick O'Hern. And now ... Thomas Bjorn? Tiger Woods has been felled by unexciting, methodical plodders in the past. Coming off a recent victory in Qatar, the veteran Bjorn will hardly be in awe of his decorated opponent. Sleeper: It's been a quiet year so far for Jason Day, but this is the type of event that has turned very good players like Ogilvy and Henrik Stenson into high-profile ones and Day's ready to make such a leap. Winner: There aren't many more talented PGA Tour members without a win than Jeff Overton. He proved last year that he can not only hang with the world's best, but can do so in this format, playing brilliant golf at times during the Ryder Cup. Boom, baby. Strength: Match play experience. Exactly half of the players in this bracket have competed in at least one of the past two editions of the Ryder Cup. Weakness: Driving distance. In this format, it's often an advantage to hit your approach shot second and on this course booming drives have plenty of fairway to find. Only Phil Mickelson and Alvaro Quiros qualify as big hitters from this group, though. Best opening-round match: Only one Wednesday game features a matchup of former AMPC finalists, as Ian Poulter is the defending champion and Stewart Cink was runner-up in 2008. Best potential later-round match: Rickie Fowler has long looked up to Phil Mickelson and the veteran has taken the youngster under his wing, even pairing with him in one match during last year's Ryder Cup. Upset special: After skipping this event last year, Mickelson decided to forgo vacation with his family and play this time around. You've got to wonder whether his heart will really be into it, though, or whether he'll have the jet gassed up and ready to join Amy and the kids as soon as possible. Sleeper: Anders Hansen is only two weeks removed from coming up one stroke shy of forcing a playoff with Quiros in Dubai. That result did allow him to become the last man to automatically qualify for this week's field. Winner: Is there a more underrated player among the world's elite than Ross Fisher? He might not look pretty, but he gets the job done, including a fourth-place performance in this event two years ago and a World Match Play title later that season. The semifinals: Fisher over Goosen and Kaymer over Overton. The finals: Kaymer over Fisher. Editor's Note: See Sobel's NCAA Tournament-style bracket here. And yet, that doesn't mean we can't employ some prior knowledge in an attempt to prognosticate what might take place this week outside Tucson. Upset special: Steve Stricker is a wily veteran and one of the world's best putters. His opening-round opponent Manassero has nothing to lose, though -- and plenty to gain. Sleeper: Martin Laird has proven his Scottish roots translate to great desert golf, as he's posted a win and a playoff runner-up in his last two starts at the PGA Tour's stop in Las Vegas. Best opening-round match: There might not be a better first-day pairing on the entire sheet than Geoff Ogilvy versus Padraig Harrington. Someone should mic these guys up, too; as two of the game's more thoughtful and eloquent speakers, their conversations could be riveting. Best potential later-round match: Chicks dig the long ball. So, too, does everyone else, which means a possible second-round matchup between Bubba Watson and Dustin Johnson would be a fun "anywhere you can hit, I can hit further" experience for all. Upset special: Peter O'Malley. Nick O'Hern. And now & Thomas Bjorn? Tiger Woods has been felled by unexciting, methodical plodders in the past. Coming off a recent victory in Qatar, the veteran Bjorn will hardly be in awe of his decorated opponent. Sleeper: It's been a quiet year so far for Jason Day, but this is the type of event that has turned very good players like Geoff Ogilvy and Henrik Stenson into high-profile ones and he's ready to make such a leap. Strength: Match play experience. Exactly half of the players in this bracket have competed in at least one of the last two editions of the Ryder Cup. Busy weeks for most 15-year-old girls are limited to texting, boy-talk and maybe some homework. Lexi Thompson isn't like most 15-year-old girls. On Monday, the phenom competed as the only female in a Minor League Golf Tour event -- playing from about 6,800 yards as opposed to the 7,100 used by all other players -- and finished in a share of third place, three strokes behind her brother Nick, who spent the past three seasons as a member of the PGA Tour. Four days later, her petition requesting "limited partnership" on the LPGA for 2011 and doubled sponsor exemptions from six to 12 was denied by commissioner Mike Whan. Want to know what ESPN.com golf writer and blogger Jason Sobel is up to? Sign up now to track him on Twitter. Considering an apparent hunger for more superstars to help the visibility of the LPGA, this may have been a difficult decision for Whan, but it was the correct one. There is dangerous precedence in skirting the rules for one individual ---it happened with Michelle Wie prior to her 18th birthday -- and it's a path the second-year commish doesn't wish to take. "Lexi has remarkable skills for a 15-year-old, and if she continues to grow and develop, I believe that she should have a great future both on and off the golf course," Whan said in a released statement. "This season, Lexi still will be able to secure up to six sponsor exemptions for LPGA sanctioned events, and also may choose to pursue additional playing opportunities through our 'open' Monday qualifier format." Therein lies the bigger story of the day. While Monday qualifiers were previously open only to LPGA members, there will now be opportunities for non-members to qualify for events through such means. With a half-dozen sponsor exemptions already at her disposal, plus earned starts into the U.S. Women's Open and Evian Masters, the teenager enters the season with a guaranteed eight appearances and the chance to earn many more. Her agent, Bobby Kreusler of Blue Giraffe Sports, told me the petition denial shouldn't be seen as a negative. In a way, the ruling may afford her the chance to play even more tournaments than had been petitioned for, but this is just one step in a longer process at figuring out what is best for Thompson's growth as both a player and person. And really, that's the most important thing here. Kreusler and Whan have been discussing the issue for a while now and each contend her best interests are at the heart of the matter. Of course, with three years remaining until she reaches the LPGA's minimum age requirement, don't expect this story to go away for good. There's a strong chance that one year from now she will petition the tour once again and, as Kreusler explained, "If she plays the way she's capable of playing, we're pretty certain there will be a different outcome." At some point every April, the following rhetorical question is anxiously posed by golf fans on couches around the world. Streeter Lecka/Getty Images/Golf Week If you can't get to Augusta National, EA Sports' new "Tiger Woods '12" game will get you close. "Wouldn't it be cool ... if you could play Augusta National Golf Club ... and the actual Masters Tournament ... on a video game?!" Wonder no longer, my friends. The world's most revered golf course and the year's first major championship will soon be available in the long-standing EA Sports "Tiger Woods" series. And yes, it will be very cool. This is the golf and gaming equivalent to the first time someone dipped a chocolate bar into another person's peanut butter. Or more pertinently, the first time someone slapped pimento cheese on white bread -- the unofficial must-have lunch of the Masters Tournament. For the first time ever, a virtual version of the entire course will be available to play from the luxury of your living room starting on March 29, just nine days before the opening round of the actual tournament. As if that isn't enough, the goal of the game's "career mode" will be to qualify for and win the Masters. Green jacket sold separately, of course. This move is the latest in a recent trend from Augusta National to not only grow the game globally, but make itself more visible. Consider it a refreshing departure from the previous exclusivity of the course. Think about it: The first and second rounds of the Masters weren't even televised until 1982; broadcast coverage wasn't allowed to show competition on the front nine holes until 2002. 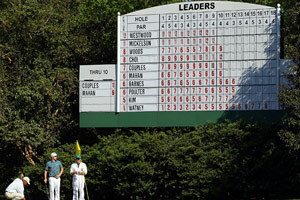 Streeter Lecka/Getty Images Augusta National's scenic views used to be available in April during the Masters. Now, golf fans will be able to see them in their living rooms all year long. And now? In recent years, the tournament has been the first major shown in both high-definition and 3-D television, the first to offer live bonus coverage on the Internet and the first to allow free admission to all children under 16 accompanied by an adult. Each of those decisions has helped the Masters appeal to a younger generation, and its inclusion in the video game continues along that pattern. "Our desire to help grow the game of golf throughout the world is sincere, and it is that commitment that first led us to EA Sports more than three years ago," said Billy Payne, chairman of Augusta National Golf Club and the Masters Tournament, in a statement. "EA Sports, Tiger Woods and the PGA Tour have developed an extremely successful franchise that responds to one of the popular entertainment choices of kids today. We hope our inclusion will foster an appreciation for the history and traditions of the Masters and inspire the next generation of golfers." It's often been said that no one can realize exactly how hilly Augusta National's terrain really is without seeing it in person. Same goes for the overwhelming colors that permeate the course. Watching on television may grant observers a glimpse into the course's beauty, but it fails to capture the other senses in a way that only being there really can. Look to the left. The world is simply green, as far as the eye can see. Look to the right. More green, with hills and swales topped in that constant outdoorsy hue. Look behind you. Straight ahead. Anywhere. It's all the same. It's all serene, peaceful, yet exhilarating. It's all so much a part of history, yet so alive today. It's all so ... perfect. The point in sharing this passage isn't to point out how much those who haven't made the pilgrimage have missed, but to prove what advantages might await in video game form -- all from the comfort of your own home. It's because of this ability to pull back the curtain that such an addition should intrigue hard-core golf fans as much as -- if not more than -- fanatical gamers. This is a chance to walk through the vaunted gates of Augusta National without needing access to drive down Magnolia Lane. It's a win-win proposition. You can play the world's most famous golf course for the first time ever. Meanwhile, 100 percent of Augusta National's proceeds from the video game will be contributed to the newly created Masters Tournament Foundation, which is designed to annually invest in development programs for the game of golf worldwide. Actually, that makes it a win-win-win proposition, the last of those being the ability to capture a Masters title. For Tiger Woods, Phil Mickelson and the world's elite golfers, that chance will come over four days in April. For the rest of us, it will soon be readily available anytime, at the click of a button. For the first time ever, a virtual version of the entire course will be available to play from the luxury of your living room starting on March 29, just nine days before the opening round of the actual tournament. When it comes to expectations of immediate success for the current crop of elite young 20-somethings and teenagers, allow me to proffer four words of caution: Don't believe the hype. Andy Lyons/Getty Images Former U.S. 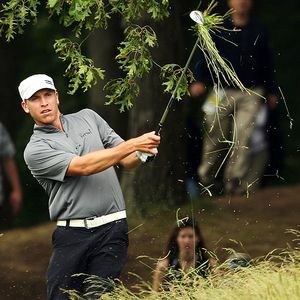 Amateur champion Ricky Barnes finished tied for second at a soggy 2009 U.S. Open at Bethpage Black. Oh, don't get me wrong. I think Rory McIlroy can win a major title any day now, Rickie Fowler has the gumption of a superstar twice his age, and Matteo Manassero might become a modern-day Seve Ballesteros. Unlike other sports, though, where top draft picks can often parlay amateur stardom into professional superstardom, young golfers usually need a few years to mature. It has less to do with talent than experience -- getting comfortable playing weekly events at the highest level, learning about the courses, even knowing where to stay, where to park and where to eat. All of those factors are reasons we rarely see fab freshmen vault to the top of this profession. Personally, I look for players in their third, fourth or fifth year as a PGA Tour member to figure these things out and gain enough experience to find success. Hunter Mahan, Jeff Overton, Nick Watney and Bubba Watson are all players who weren't overnight sensations, but they recently crossed the threshold into the next echelon at this point in their careers. The following six players are hardly unknown commodities. Some have already won tournaments and some have contended for major championship titles. But each one is still on the rise. If you've got a fantasy golf squad, stock up on these guys, then sit back and watch 'em rake in the big bucks for you. And if not, well, at least you can impress the other guys at the local 19th hole. Ricky Barnes: He was a can't-miss kid coming out of the University of Arizona, where he shared the Ben Hogan Award and won the 2002 U.S. Amateur. And then, he missed. The ultra-athletic Barnes toiled on the developmental Nationwide Tour for years before finally getting called up to the big leagues in 2009. His struggles that season were counterbalanced by a surprising runner-up finish at the U.S. Open, and then he followed with six top-10s in 2010. Expect another major spike in success as he becomes more comfortable in his surroundings. Jason Day: If golfers were stocks, this 23-year-old Aussie would be a blue-chipper on the verge of making a lot of people very rich. Instead, he's the one about to prosper. In his third year on tour, Day won the Byron Nelson Championship and finished fifth and second, respectively, at the first two FedEx Cup playoff events. That's a breakthrough season for most young players, but for him it's just a sign of bigger things to come. Don't be surprised if Day is among the biggest earners on the entire circuit this season -- and for many years to come. Martin Laird: Members of boy bands and Hollywood starlets have spent less time around Justin Timberlake the past few years than this Scotsman via Colorado State University. Laird won the entertainer's eponymous tournament in 2009, then lost in a playoff last season. The latter came just two months after kicking away a title at The Barclays, then losing that one in extra holes, too. Chalk it all up to experience, as Laird will continue to grow in his fourth year on the PGA Tour. Steve Marino: Best player without a career victory? Marino is definitely in the discussion, as he has pulled in nearly $7 million since joining the PGA Tour in 2007. While his earnings and ranking increased in each of his first three seasons, the University of Virginia alum witnessed a slide in his fourth year. Don't let it dissuade you from being bullish on his future, though. When Marino is on -- as he was with top-five finishes in back-to-back weeks at Riviera and Pebble Beach last season -- he can hang with the best of 'em. Andres Romero: Admit it: Even though he had finished T-8 at the Open Championship one year earlier, you had never heard of Romero until he took the lead at Carnoustie with a few holes left to play in 2007. Don't feel bad; you're hardly alone. He followed by winning the Zurich Classic and Rookie of the Year honors the next season, but has struggled ever since. Buying a home in the U.S. is in the works -- currently the Argentina native doesn't have one -- and should help his comfortability on the PGA Tour. Webb Simpson: There are some pundits -- OK, me -- who believe Simpson should have won the Rookie of the Year award in 2009. He had one more top-10 and the same amount of top-25s as winner Marc Leishman, but the Aussie took the honors based largely on a late-season runner-up at the BMW Championship. No matter. While Simpson faded in those two categories and in money earned during his sophomore season, the Wake Forest product has too much talent to keep him from the winner's circle for much longer. Player of the Year? Been there, debated that. Rookie of the Year? Ditto. The 2010 golf schedule is finally complete and all of the major season-ending awards have been passed out. Well, almost all of 'em. Still left are some of the more "unique" awards, but wait no longer. Here are the last of this year's golf awards. We promise. -- Derek Lamely, who won the Puerto Rico Open. -- Matt Bettencourt, who won the Reno-Tahoe Open. -- Bill Lunde, who won the Turning Stone Resort Championship. And the winner is ... Lamely. The rookie truly is a household name only in his own household. 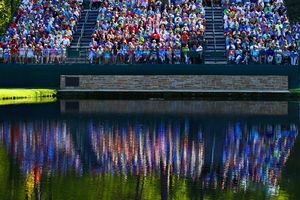 AP Photo/The Roanoke Times/Kyle Green Sure, Stuart Appleby shot a final-round 59 to win the Greenbrier Classic on the PGA Tour. But was it good enough to win Jason Sobel's "Sweet'N Low Award" for 2010? -- Stuart Appleby and Paul Goydos, both of whom shot 59 in a PGA Tour event. -- Ryo Ishikawa, who shot 58 in a Japan Tour event. -- Bobby Wyatt, who shot 57 in the Alabama Boys State Junior Championship. And the winner is ... Wyatt. Hey, a number is a number and the 17-year-old tied an all-time record for lowest score in a competitive tournament from at least 6,500 yards. -- Jiyai Shin, who became No. 1 on May 3. -- Ai Miyazato, who became No. 1 on June 21. -- Cristie Kerr, who became No. 1 on June 28. And the winner is ... none of the above. Believe it or not, the player who held the honor for the most weeks from the first of the year through season's end was Ochoa. It seems like she's already been gone for awhile, but Lorena actually led the Rolex list for the first 17 weeks of the year. Woods. The word has many meanings in the game of golf. It could refer to the club most often used off the tee. Or where those errant tee shots usually wind up. -- Lee Westwood, who remained major-less through yet another season, though he did ascend to No. 1 in the world ranking -- a nice consolation prize. -- Tiger Woods, who endured the first winless season of his career and lost that No. 1 ranking to Westwood. -- Willie Wood, who competed in two PGA Tour events and earned a grand total of $6,540 -- dead last of the 248 players who cashed a check this year. And the winner is ... Wood. Hey, with those kind of earnings, the Champions Tour-eligible player needs to win something. -- Dustin Johnson, after his wayward tee shot on the 72nd hole at Whistling Straits resulted in a penalty stroke to miss out on a playoff at the PGA Championship. He returned to win the BMW Championship four weeks later. -- Tiger Woods, who crashed into a fire hydrant in front of his home last Thanksgiving. -- Martin Kaymer, who wrecked a go-kart last year, resulting in three broken bones in his foot and two months on the shelf. And the winner is ... Kaymer. Winning the PGA Championship might have been the clincher, but this quote of the year candidate didn't hurt, either: "If I'm honest, s--- happens. So it was just unlucky, a very unlucky accident. ... But I'm sure that I will do it again in the future." -- The U.S. Ryder Cup team, for its lavender cardigans. -- The U.S. Ryder Cup team, for its patches on hats, shirts and sweaters. -- The U.S. Ryder Cup team, for its rainsuits that weren't waterproof. And the winner is ... the U.S. Ryder Cup team. Big surprise, huh? But while eschewing the ol' red, white and blue, and outfitting its players in what looked like leftovers from the Memorial Day youth soccer tournament were embarrassing, this award was clinched for the leaky jackets that forced PGA of America officials to hunt through the merchandise tent for ones that didn't, you know, malfunction. -- Dustin Johnson, who famously grounded his club in a bunker on the 72nd hole of the PGA Championship. -- Ryuji Imada, who mistakenly took so many illegal drops at the Mission Hills Star Trophy in China that he added 26 penalty strokes. -- Ian Poulter, who dropped his ball on the green during a playoff in Dubai, flipping his ballmarker and resulting in a penalty that essentially eliminated him from contention. And the winner is ... a three-way tie. When it comes to bad penalties, what a stupid each of these guys was in his own special way. Let's pretend for a minute that each of the world's major professional tours annually banded together to honor one individual as the Global Golfer of the Year. 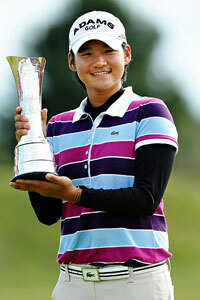 Paul Ellis/AFP/Getty Images Yani Tseng is the only player to win two major championships in 2010, male or female. She started the year with a victory at the Kraft Nabisco and then won the Women's British Open later in the season. Come to think of it, this isn't such a bad idea. In a December month already saturated with announcements of season-ending accolades, at least this would be a major declaration, worthy of 19th hole debates from Argentina to Zimbabwe. Well, if such an award did exist, this year's winner might surprise you. The player in mind didn't triumph at a revered golf sanctuary like Augusta National, Pebble Beach or St. Andrews. Never rose to No. 1 in the world. Didn't qualify for the Ryder Cup or FedEx Cup. Rarely made off-the-course headlines. In fact, the only time this player really garnered conversation was in victory -- and that happened only three times. Then again, two of those triumphs came at major championships, a claim no other golfer can make this year and one that only Padraig Harrington (2008) and Tiger Woods (2007) can make in the past half-decade. I'm referring, of course, to Yani Tseng. Winner of the Kraft Nabisco Championship and Women's British Open at the tender age of 21, she posted eight top-10 finishes in 19 appearances on the LPGA, winning the tour's points-based Player of the Year Award while finishing fourth on the final money list. Those are numbers that should place her season among the best of this year on any tour, either gender. Full disclosure: If this award existed for 2010 and I was offered a ballot, my vote would be cast for Graeme McDowell in a closely contested race. That doesn't mean a strong case can't be made, though, for Tseng, who has developed into the type of player we usually only witness after years of experience in the professional ranks. Including the 2008 LPGA Championship title in her rookie season, she has amassed three major championship victories in her first three years since joining the major league circuit from her native Taiwan. "When I was a rookie," Tseng recalled after Sunday's final round of the LPGA Tour Championship, "I said my dream was to be the first Chinese player to win a major, then it just came in the first half-year. Sometimes dreams take a long time, but that happened so quickly. Now I'm really looking forward to winning the U.S. Open." That's right. While much of the golf world is already going gaga over the potential of Rory McIlroy, Rickie Fowler and Michelle Wie -- and for good reason -- their fellow 21-year-old has lapped them in the trophy department. Despite being of legal drinking age only since January and still a few years from minimum car rental requirements, Tseng is already three-quarters of the way to the career Grand Slam. In case that doesn't sound significant enough, check out the ultra-impressive list of those who have accomplished the feat so far: Pat Bradley, Juli Inkster, Annika Sorenstam, Louise Suggs, Karrie Webb and Mickey Wright on the women's side; Ben Hogan, Jack Nicklaus, Gary Player, Gene Sarazen and Tiger Woods for the men. Tseng has an opportunity to not only become the 12th player in history to reach the goal, but has a few years to best Woods -- who was 24 when he completed the Slam -- as the youngest ever. And yet, Tseng isn't content to stick with what's gotten her to this point. A classic grip-it-and-rip-it player who makes birdies in bunches and can turn tournament starts into all-or-nothing propositions, she sees room for improvement. This season she ranked eighth on the LPGA in scoring average (70.66), ninth in percentage of rounds under par (69.1) and 10th in driving distance (262.3) -- all solid numbers, but hardly the stuff of legend. Ask whose game she would like to emulate and Tseng quickly responds with the names of Jiyai Shin, Ai Miyazato and Na Yeon Choi -- three players with whom she has little in common. Which is exactly why she would like to emulate their games. "The way they play, their style is different than me," Tseng said. "They're so consistent, swing so smooth, hit the fairways and make their putts. I'm an aggressive player, have a lot of ups and downs. I think I need to learn from them." "Well, I think she's amazing," Choi said. "She hits every shot like really powerful. And she is a good fighter. Yeah, definitely she [should] get Player of the Year. She's the best player." While the U.S. Women's Open title remains a long-term goal, Tseng has her eyes on another previously unopened prize in the early part of the 2011 season: She wants to ascend to No. 1 in the Rolex Rankings, a spot that has been shared by Shin, Miyazato and Cristie Kerr during the current year, but continues to elude Tseng. "I think it's going to be hard at the beginning of next year," she said. "Everyone is still working so hard for this. I feel like it's going to change a little bit." Asked whether that's a good thing for the game or if it would be more beneficial to have a steady, regular No. 1 player, she doesn't hold back. "I don't know," Tseng replied with a laugh. "If I can hold it for a long time, I think that would be a good thing." For now, she will have to be content with the knowledge that her season ranked with the best of any player in the world. It's too bad there's no award for such a thing. Yani Tseng just might have won it. Quick: Name the last three winners of the PGA Tour's annual Rookie of the Year award. If the names Marc Leishman, Andres Romero and Brandt Snedeker don't immediately come to mind, you are forgiven. Each was a deserving winner, but when it comes to that compartment of your brain specifically employed for such record-keeping, their titles were likely forgotten before they were ever remembered. That isn't the case for this year's top freshman. Saturday's announcement that Rickie Fowler earned the award has quickly turned into a lightning rod topic within the golf world, as the talented youngster defeated Quail Hollow Championship winner Rory McIlroy in a player vote that was received with much derision. Not from the candidates, mind you. Prior to the announcement, Fowler told me, "I voted for Rory. I'm not going to vote for myself, I'll tell you that. That's just not who I am. He had a great year; he's definitely deserving." Meanwhile, McIlroy followed the decision by telling reporters at the Chevron World Challenge, "It's fine. Look, I really didn't want it. I'm not a rookie. When I joined the PGA Tour, I was top-10 in the world. Rickie had an unbelievable year. He deserves it." The ire didn't truly escalate until Monday morning, when world No. 1 Lee Westwood -- a Ryder Cup teammate of McIlroy -- tweeted his displeasure for the result. "Just seen Ricky Fowler has been given rookie of the year!" Westwood wrote. "Yes he's had a good year but rory mcilroy 3rd in 2 majors and an absolute demolition of the field at quail hollow! Oh yes and on the winning Ryder cup team! Please! Is this yet another case of protectionism by the pga tour or are they so desperate to win something! Wouldn't have something to do with Rory not joining the tour next year? Maybe the PGA tour just employs the same voting process as FIFA! Come on, fairs fair!" Simply check their results and you'll find two worthy candidates, either of whom would have defeated the competition in the last several years. McIlroy had one win to Fowler's zero and finished in third place at two majors; Fowler finished three spots higher on the money list and competed in a dozen more events. While not a performance-based statistic, don't overlook the impact of those appearance numbers. PGA Tour end-of-season awards are voted upon by the membership rather than a points system, as used on the LPGA Tour. I spoke with a handful of current players who said that while Fowler was competing on a weekly basis, they'd never even seen McIlroy and therefore didn't feel it was right to vote for someone who seemed like a part-timer. It shouldn't come as breaking news that fellow players don't exactly pore over the results when filling out their ballots. (When I asked Matt Kuchar after winning The Barclays whom he would vote for Player of the Year, he said, "I normally pass that aside. I try not to think about that. I let my wife or somebody else handle that for me.") So yes, these awards do become quasi popularity contests -- for better or worse. Throw in the fact that McIlroy has already alienated himself from the PGA Tour by declaring his intention to give up full status for the upcoming season and many players felt they owned even more of a reason to vote against him. While Westwood and others can't be blamed for stating their opinion of the result, their anger is displaced. When the PGA Tour gives its players sole responsibility for determining winners of these awards, it will always come with an asterisk, since -- much like college football or basketball coaches voting in a national poll for their sports -- they are more worried about their own games than those of their peers. And to continue an annual favorite rant of mine: The PGA Tour should also provide vote totals for the awards. Did Fowler garner 90 percent of the vote or 51? Hey, revealing the percentages is good enough for elected government officials; it should be enough for the PGA Tour, too. Just like those political positions, not everybody is going to agree with majority opinion, but they've got to live with it. If Westwood sees fit to cure the golf world of such future injustices, though, he only needs to do one thing to make his voice heard: join the PGA Tour. With membership, the No. 1-ranked player would be allowed to exercise his right to vote at the end of each year. Jason Sobel is a golf columnist and blogger for ESPN.com. He grew up in Islip, N.Y., attended Brandeis University in Waltham, Mass., and wrote for newspapers including Newsday and The Boston Globe. He was also a member of the Brandeis golf team during his junior year -- not for his on-course skills but because he owned a car and didn't mind driving teammates to practice. Sobel, who joined ESPN in 1997, earned four Sports Emmy awards as a member of ESPN's Studio Production department. He was ESPN.com's golf editor from July 2004 until becoming a columnist/blogger in April 2008.